I have go-to cookbooks for different purposes, different types of dishes, or different times of year. For instance every year when my birthday is approaching, the book I turn to for special dishes for celebrating with flavors that I love is Sunday Suppers at Lucques by Suzanne Goin published in 2008. It would be an understatement to say that I was a little excited when I learned she was releasing a new book. The A.O.C. Cookbook appeared at the end of last month, and I received a review copy. In a lot of ways, this new book feels like a continuation of Sunday Suppers. The seasonality, style of cooking, and flavors are consistent, but this time rather than menus for meals, the dishes are organized by starters, mains, vegetables, and desserts. The recipes are based on the menu from Goin’s restaurant A.O.C. which focuses on small plates, but in the book, the savory recipes are written to serve six as full courses or appetizers. Each section of the book is divided by season so you can turn to the appropriate time of year for what’s fresh and available at the markets. Also, in this book, Goin’s business partner, Caroline Styne offers wine pairing suggestions for every dish. And, there’s a cheese guide with descriptions of every type ever served at A.O.C. It was interesting to read that Goin has learned from her fans over the years. She knows that some cooks prefer simpler, streamlined recipes and others enjoy a bit of a challenge. In the headnotes, she mentions when a recipe fits that latter category so you know what to expect. I’ve flagged several pages including the ones for Dandelion and Roasted Carrot Salad with Black Olives and Ricotta Salata; Black Bass with Fennel Puree, Winter Citrus, and Green Olives in Green Harissa; Grilled Quail with Couscous, Walnuts, and Pomegranate Salsa; Turmeric-Spiced Root Vegetables with Kaffir Lime Yogurt and Mint Chutney; Torchio with Kabocha Squash, Radicchio, Walnuts, and Taleggio; and Ricotta Cheesecake with Dried Fruit Compote and Walnut Biscotti. And, those are just a few of the fall and winter dishes. I’ve tried two items from the book so far. The Butterscotch Pot de Creme with Salted Cashew Cookies was a comfort-food kind of dessert at its best. Sadly, butterscotch is never particularly photogenic, but it is delicious especially paired with a crunchy, nutty cookie. 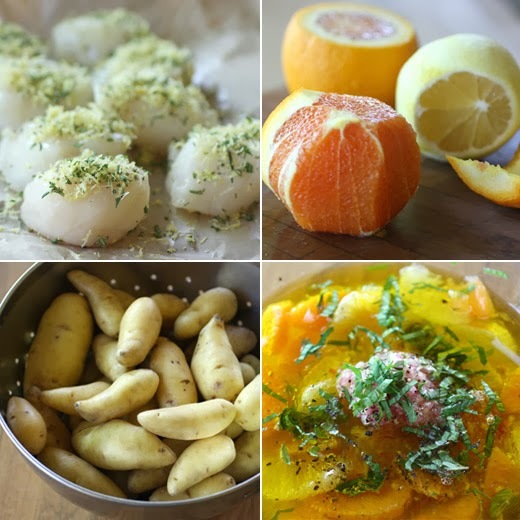 The second dish I made was the Sea Scallops with Saffron Potatoes and Orange-Meyer Lemon Salsa. This was a classic Suzanne Goin dish to my mind due to the lemon zest and herb seasoning applied to the scallops before cooking and the bright-tasting, citrus salsa. I took a couple of liberties with the recipe, and you can see the original version from the book below. Rather than skewering the scallops on trimmed rosemary sprigs and grilling, I seared the scallops in a hot pan. Also, even though blood oranges had appeared at the grocery store the week before I went looking for them, on the day I needed them there were none. I used Cara Cara navels instead which aren’t as deep red in color and are less bitter. It was the best option available, but I wish I could have used blood oranges. For the potatoes, I used fingerlings that I cut into thick chunks. They braised on top of the stove in a bath of saffron, water, and olive oil with onion, and chile de arbol. They absorbed all those lovely flavors while cooking until tender. 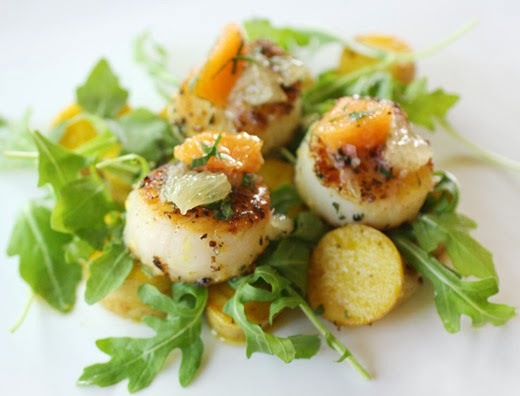 The plate was assembled with potatoes topped with arugula, then the scallops, and finished with the citrus salsa on top. This dish was delightful in every way. The potatoes were both literally and figuratively the foundation. Earthy and mild with hints of saffron and onion in each bite, they countered the bitter, peppery greens while the scallops were sweet bites of the sea. And, the salsa punctuated everything just as it should. It’s going to be a lot of fun to cook from this book from season to season. Excerpted from The A.O.C. Cookbook by Suzanne Goin. Copyright © 2013 by Suzanne Goin. Excerpted by permission of Knopf, a division of Random House LLC. All rights reserved. No part of this excerpt may be reproduced or reprinted without permission in writing from the publisher. I love the colors of this Sicilian- inspired dish—the deep red, orange, and yellow tones of the salsa spooned over those white scallops and over the mounds of sienna- hued potatoes remind me of an Italian vacation. I was never a big fan of scallops until I tasted the super- sweet, succulent, meaty East Coast diver- caught ones we are lucky enough to get from Steve Connolly in Gloucester, Massachusetts. Seek them out—they are so worth it! This preparation would also work beautifully with halibut, sole, or other white flaky fish. NOTE Mexican diver-caught scallops are a good alternative to the Atlantic sea scallops. Remove the rosemary leaves from the branches except for 2 inches at the bottom of each. Cut the leafless end of each branch at an angle with a sharpknife to make a point and coarsely chop the picked rosemary leaves. Season the scallops with the lemon zest and 1 1/2 tablespoons chopped rosemary. Skewer three scallops onto each rosemary branch. Cover and refrigerate. Place the shallots, champagne vinegar, and a healthy pinch of salt in a small bowl, and let sit for 5 minutes. Cut away the stem and blossom ends from the Meyer lemons. Stand the lemons on one end, and cut them vertically into 1/8-inch slices (keeping the rinds on). Stack the slices in small piles on a cutting board, and cut them lengthwise into 1/8-inch thick matchsticks. Line up the matchsticks, and cut them into 1/8-inch cubes. Cut away the stem and blossom ends from two blood oranges. Place the oranges cut- side down on a cutting board. Following the contour of the fruit with your knife, remove the peel and cottony white pith, working from top to bottom, and rotating the fruit as you go. Then hold the oranges in your hand, one at a time, and carefully slice between the membranes and the fruit to release the segments in between. Add the diced lemon, blood- orange segments, their juices, and the juice of the remaining orange to the shallot mixture. Stir in 1/2 cup olive oil, the mint, 1/2 teaspoon salt, and a few grinds of pepper. Light the grill 30 to 40 minutes before cooking, and take the scallops out of the refrigerator. Place the saffron in a small bowl, and pour 1 cup warm water over it. Heat a large Dutch oven over high heat for 1 minute. Swirl in 1/4 cup olive oil, and wait 1 minute. Add the onion, thyme, chile, 1/2 teaspoon salt, and a few grindings of black pepper. Reduce the heat to medium, and sauté for about 3 minutes, stirring often, until the onion is translucent. Turn up the heat to medium- high. Add the potatoes and 2 tablespoons of olive oil, and season with 1 teaspoon salt and a few grindings of pepper. Don’t stir the pan for a couple of minutes while the potato edges sear in the hot oil and form a nice crust. Lift and tilt the pan to distribute the oil evenly. After 3 to 4 minutes, firmly shake the pan to loosen the potatoes. Turn with a wooden spoon and cook for another 3 minutes, stirring to coat with the onions. Add the saffron water. Stir to combine, cover the pot, reduce the heat to low, and let simmer for about 25 minutes, until the potatoes are nicely glazed and tender when poked with a paring knife. If at any point the liquid starts to dry up, add a little more water. The saffron potatoes should be glazed, neither dry nor soupy. Turn off heat, and put the lid halfway on. When the coals are broken down, red, and glowing, brush the scallops with remaining 2 tablespoons olive oil, and season with salt and pepper on both sides. Place the skewered scallops on the grill, and cook for 4 minutes, rotating once to create crosshatch marks and a browned crust. Flip the scallops, move them to a cooler side of the grill, and cook for another 1 to 2 minutes, until they’re medium-rare. Spoon the hot saffron potatoes into the center of six dinner plates, scatter the dandelion, and place the scallop skewers on top. Spoon the blood orange-Meyer lemon salsa over the scallops. So gorgeous Lisa! What a great bight fresh dish - perfect for grayer days this time of year. I need to get my hands on a copy of Suzanne Goin's new book. Delightful and refined! This dish is beautiful. This is so delightful and flavourful! Oh my goodness this sounds (and looks) amazing! I think I need to add a couple of more cookbooks to my list! Una linda receta me encantò la salsa ,abrazos. Sounds like a marvelous cookbook, Lisa...and both the scallops and potatoes sound divine!!! It looks so bright and delicious! Wow Lisa, such an elegant way to serve scallops...love the flavors in this dish...citrus and fresh herbs. Fantastic! These are so perfect looking!! Scallops are my wife's favorite, so I'm always looking for new way to prepare the. These look beautiful! Love the saffron potatoes, and that's a really original salsa. Good stuff - thanks. I must put that cookbook on my wish list, and this recipe must be made very soon. Looks lovely and sounds delicious. Have a great Thanksgiving Lisa. This is a must make meal for me. 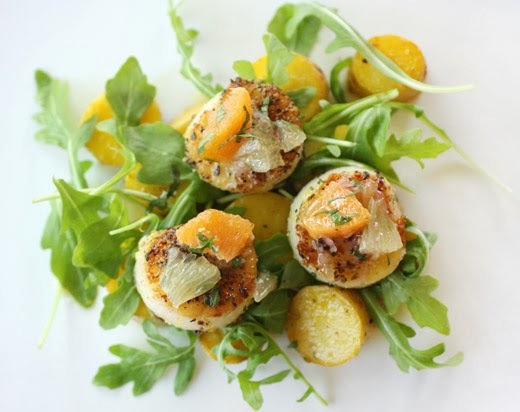 I make a seared scallop and orange salad so I can imagine how good this recipe is. A true pleasure for the eyes as well as for the taste buds . I love cookbooks! And you did a beautiful job with this recipe - what a glorious presentation! Both of those books are truly wonderful - as are the restaurants. This is my first visit to your site, and I know I will return often. Best wishes for a wonderful holiday. i'm really beginning to appreciate properly prepared scallops, and these sound amazing! great flavors, lisa, and your final dish looks beautiful! I love the color combination here, Lisa. The prep photos look almost as good as the finished product! What an interesting combo of flavors. I love scallops!